N.B. : Washington Times title: "The Case for Assad." Western governments should support the malign dictatorship of Bashar al-Assad. Here is my logic for this reluctant suggestion: Evil forces pose less danger to us when they make war on each other. This (1) keeps them focused locally and it (2) prevents either one from emerging victorious (and thereby posing a yet-greater danger). Western powers should guide enemies to stalemate by helping whichever side is losing, so as to prolong their conflict. This policy has precedent. Through most of World War II, Nazi Germany was on the offensive against Soviet Russia and keeping German troops tied down on the Eastern Front was critical to an Allied victory. Franklin D. Roosevelt therefore helped Joseph Stalin by provisioning his forces and coordinating the war effort with him. In retrospect, this morally repugnant but strategically necessary policy succeeded. And Stalin was a far worse monster than Assad. Stalin, Saddam Hussein ... and Bashar al-Assad? The Iraq-Iran war of 1980-88 created a similar situation. After mid-1982, when Ayatollah Khomeini's forces went on the offense against those of Saddam Hussein, Western governments began supporting Iraq. Yes, the Iraqi regime had started the hostilities and was more brutal, but the Iranian one was ideologically more dangerous and on the offensive. Best was that the hostilities hobble both sides and prevent either one from merging victorious. In the apocryphal words of Henry Kissinger, "It's a pity they both can't lose." 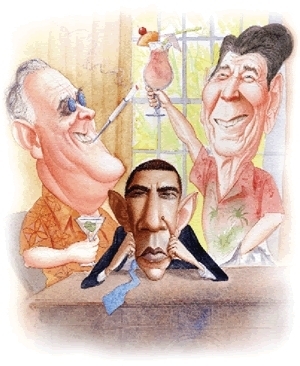 FDR, Reagan ... and Obama? In this spirit, I argued then for U.S. help to the losing party, whichever that might be, as in this May 1987 analysis: "In 1980, when Iraq threatened Iran, our interests lay at least partly with Iran. But Iraq has been on the defensive since the summer of 1982, and Washington now belongs firmly on its side. … Looking to the future, should Iraq once again take the offensive, an unlikely but not impossible change, the United States should switch again and consider giving assistance to Iran." Applying this same logic to Syria today finds notable parallels. Assad fills the role of Saddam Hussein – the brutal Baathist dictator who began the violence. The rebel forces resemble Iran – the initial victim getting stronger over time and posing an increasing Islamist danger. Continued fighting endangers the neighborhood. Both sides engage in war crimes and pose a danger to Western interests. 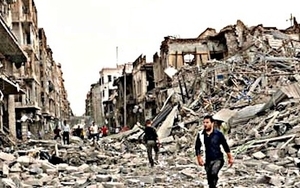 Yes, Assad's survival benefits Tehran, the region's most dangerous regime. But a rebel victory, recall, would hugely boost the increasingly rogue Turkish government while empowering jihadis and replacing the Assad government with triumphant, inflamed Islamists. Continued fighting does less damage to Western interests than their taking power There are worse prospects than Sunni and Shi'ite Islamists mixing it up, than Hamas jihadis killing Hizbullah jihadis, and vice-versa. Better that neither side wins. A scene of destruction in Aleppo. The Obama administration is attempting an overly ambitiously and subtle policy of simultaneously helping the good rebels with clandestine lethal arms and $114 million in aid even as it prepares for possible drone strikes on the bad rebels. Nice idea, but manipulating the rebel forces via remote control has little chance of success. Inevitably, aid will end up with the Islamists and air strikes will kill allies. Better to accept one's limitations and aspire to the feasible: propping up the side in retreat. At the same time, Westerners must be true to their morals and help bring an end to the warfare against civilians, the millions of innocents gratuitously suffering the horrors of civil war. Western governments should find mechanisms to compel the hostile parties to abide by the rules of war, specifically those that isolate combatants from non-combatants. This could entail pressuring the rebels' suppliers (Turkey, Saudi Arabia, Qatar) and the Syrian government's supporters (Russia, China) to condition aid on their abiding by the rules of war; it could even involve Western use of force against violators on either side. That would fulfill the responsibility to protect. On the happy day when Assad & Tehran fight the rebels & Ankara to mutual exhaustion, Western support then can go to non-Baathist and non-Islamist elements in Syria, helping them offer a moderate alternative to today's wretched choices and lead to a better future. (1) Before this article appeared, I gave a several interviews (here, here and here) advocating tactical support for the Assad regime; these prompted name-calling by CAIR and some hysterical reactions about me urging genocide in Syria. No: I look forward to the day when Syria is at peace with itself and a good neighbor, when its government is democratic and law-abiding. But until that distant time, I prefer that evil forces direct their attentions against each other than against the outside world. (2) To the argument that early Western support for the rebels would have prevented the Islamists from dominating them (which they now do), I reply that Western powers did provide early support to rebels in Tunisia, Libya, and Egypt and look what that achieved – Islamists dominate all three of those countries. The same would likely have been the case in Syria. Western assistance is not that influential in altering the course of an ideological movement. (3) I dislike advocating support for Assad and respect the intentions of those who share my goals but disagree with my means. I do, however, see them engaging in wishful, non-strategic thinking. (4) That my approach gives priority to strategic considerations marks it, in the context of modern Western politics, as conservative. Liberals enjoy a confidence in their own wellbeing that conservatives lack. Where liberals tend to worry about others (snail darters), conservatives tend to worry about themselves (a sufficient electricity supply). Consistent with this temperamental difference, the former focus on civilian welfare in Syria and the latter on Western security. (5) My advice is hardly original to me but is old-fashioned Realpolitik. Put differently, it fits into a divide-and-rule tradition that goes back to the Romans. (6) Assad's staying in power has the advantage that the regime's chemical weapons are less dangerous than if he fell. (7) The longer the Syrian insurgency continues, the greater the chances of its prompting unrest in Iran. Plus, it reduces the Erdoğan government's aggressiveness. Apr. 13, 2013 update: I note the career of this column at "Responses to the 'Support Assad' Argument." May 11, 2013 update: And if the premise for the above article turns out to be wrong and Assad is winning, not losing the civil war, then I raise the reverse idea today at "Support the Syrian Rebels?" Indeed, in retrospect, "Support Assad" was not the right title for this column, for my argument is not that but "support which ever side is losing." A more accurate title might have been a quote from Shakespeare's Romeo and Juliet, "A plague o' both your houses!" whether supported by Qatar, Saudi Arabia, or Turkey, are passionately and aggressively anti-Western, anti-Russian, anti-Chinese, and anti-Israel. All of the non-Sunni world has a huge stake in their defeat and might even consider ways to help them fight each other. A victory by either side would be equally undesirable for the United States. At this point, a prolonged stalemate is the only outcome that would not be damaging to American interests. Indeed, it would be disastrous if President Bashar al-Assad's regime were to emerge victorious after fully suppressing the rebellion and restoring its control over the entire country. Iranian money, weapons and operatives and Hezbollah troops have become key factors in the fighting, and Mr. Assad's triumph would dramatically affirm the power and prestige of Shiite Iran and Hezbollah, its Lebanon-based proxy — posing a direct threat both to the Sunni Arab states and to Israel. a decisive outcome for either side would be unacceptable for the United States. An Iranian-backed restoration of the Assad regime would increase Iran's power and status across the entire Middle East, while a victory by the extremist-dominated rebels would inaugurate another wave of Al Qaeda terrorism. There is only one outcome that the United States can possibly favor: an indefinite draw. By tying down Mr. Assad's army and its Iranian and Hezbollah allies in a war against Al Qaeda-aligned extremist fighters, four of Washington's enemies will be engaged in war among themselves and prevented from attacking Americans or America's allies. That this is now the best option is unfortunate, indeed tragic, but favoring it is not a cruel imposition on the people of Syria, because a great majority of them are facing exactly the same predicament. Luttwak stops one step short of me, for I counsel helping Assad if he is losing and he does not. Maintaining a stalemate should be America's objective. And the only possible method for achieving this is to arm the rebels when it seems that Mr. Assad's forces are ascendant and to stop supplying the rebels if they actually seem to be winning. Mar. 14, 2015 update: CIA Director John Brennan has stated that the U.S. government does not want the Assad regime to collapse, fearing this would open the was for ISIS and others to take power. Noting that "extremist elements" are "ascendant right now" in some parts of Syria, he observed: "The last thing we want to do is allow them to march into Damascus." Comment: Again, the Obama administration unwittingly sounds like me, preferring a balance to one side winning outright.